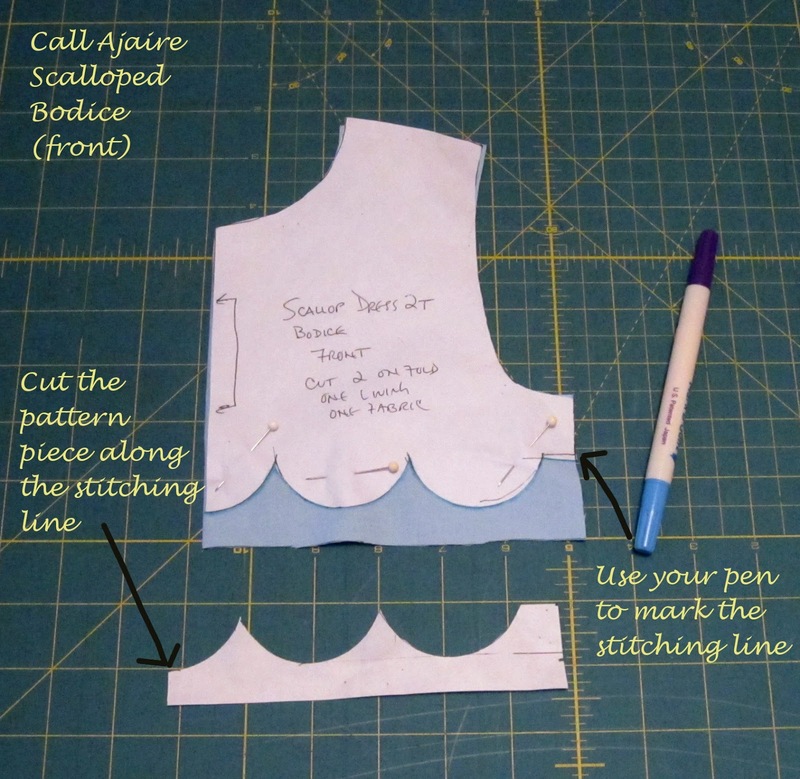 When I decided to make a scalloped bodice for the final week of Project Run & Play, I knew right away that I wanted to pair it with an under the sea themed fabric. One of my favorite kid songs (and book) is called Down At The Sea Hotel. It’s a Greg Brown Lullaby about the animals under the sea and how they end their day going to sleep at The Sea Hotel. I was singing it in my head the whole time I was making the Scallops By The Sea dress so when I heard Sew In Tune was starting up this week I thought it was a perfect pairing for their Flickr group. As I promised in the previous post about the dress, I figured out (through trial and error) the best way to create the scalloped edge and tie the whole peter pan collared neckline into the lining at one time. The following is how I did it. I started with a basic bodice pattern. This is one that I’ve modified a few times recently to make the fit just right for a short bodice that ends just at the bottom of Bean’s armpit. I’m sure you could use any bodice pattern that you know will fit to start with. Because I wanted the scallops to end up the length that the original bodice would have been, I added about a half an inch to the bottom edge on both the front and back patterns. It doesn’t really matter how much you add since it’ll mostly be removed later. Consider it a hefty seam allowance. 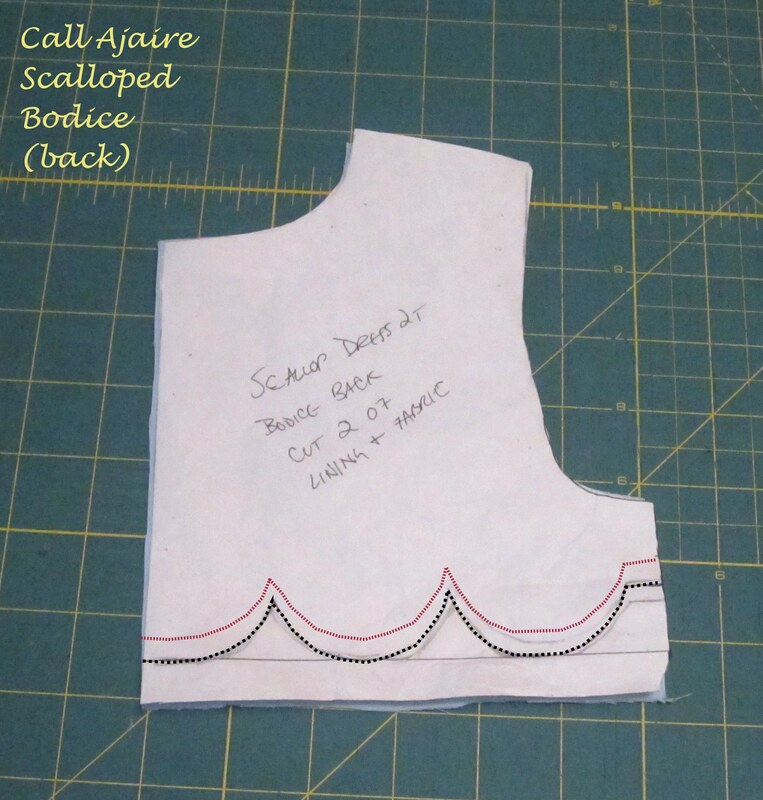 I then took a round shaped object that was roughly the size of the scallops I wanted and traced some scallops across the original bottom edge of the pattern. I think I used the top of a fat spice jar I have. 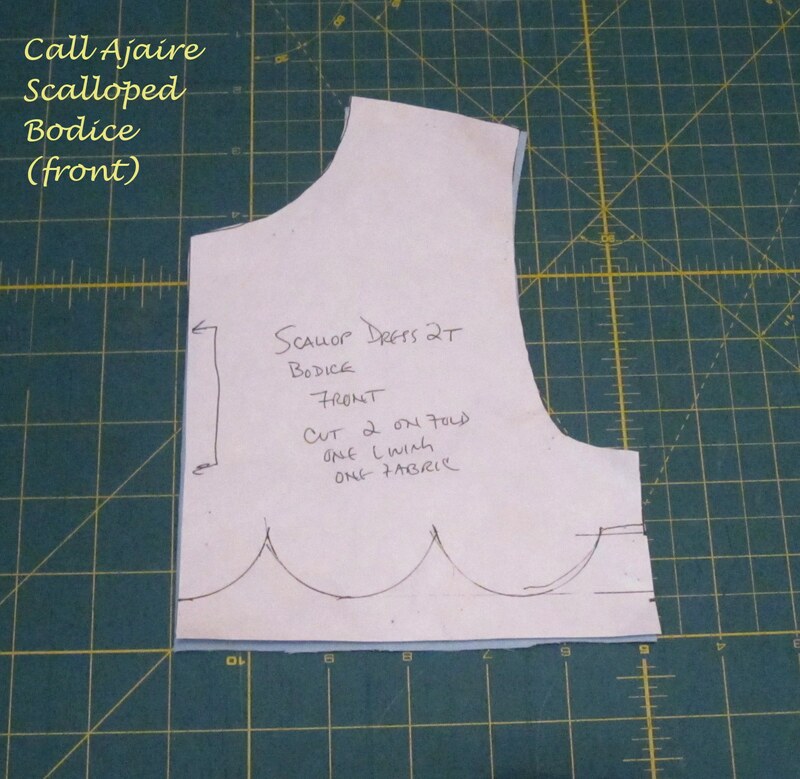 Starting at the center front of the top bodice I drew half a scallop since I wanted a scallop centered in the middle. Do whatever you’d like here, just make sure you remember that if the top bodice is cut on the fold then whatever you do on one side of center will show up on the other. In this pattern the front is cut on the fold and the back is cut in two pieces so there is seam allowance on the center back edge which is why you see in the photo above that the “center” scallop seems too wide. I also made sure to end the scallops on the side edge with enough room left over for the side seam allowance (I use 2/3″) so that the side edges would match properly with two scallops lining up side by side. 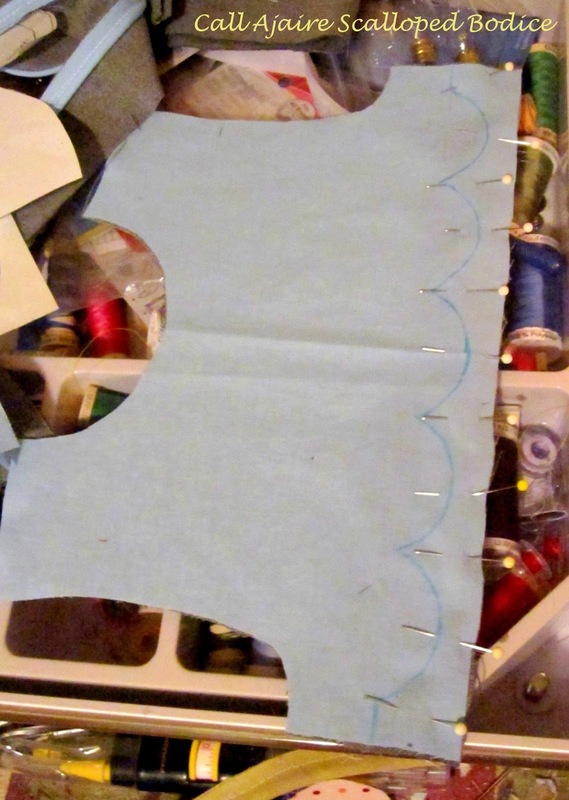 Once I cut out both lining and main fabrics from the bodice patterns I then cut the patterns along the scallops. Using the cut pattern I marked with fabric pen the outline of the scalloped pattern on the wrong side of the lining only. This outline is going to be the stitching line for the scallops. 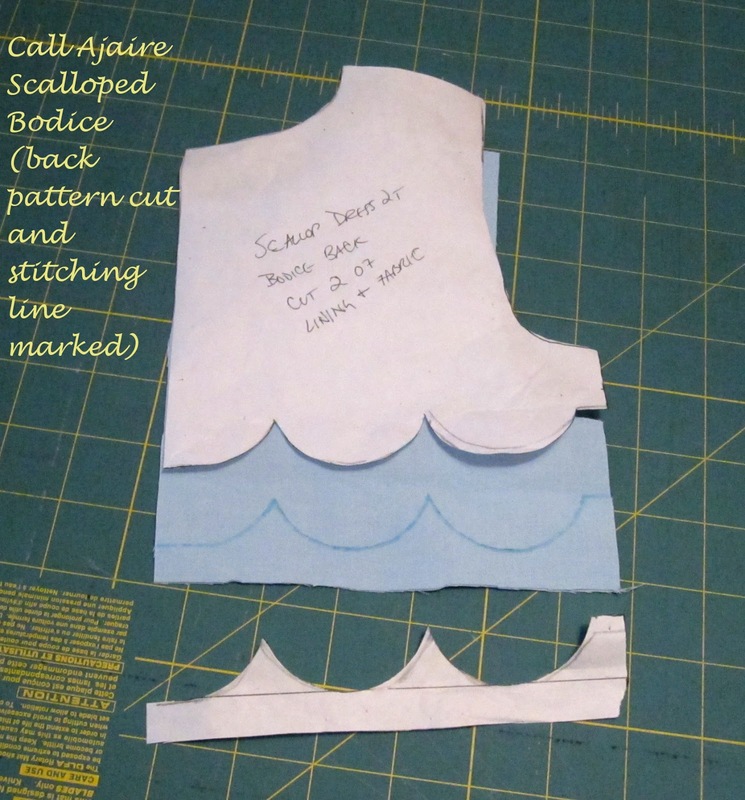 When I first tried putting the scalloped bodice together I came at it differently. I cut the fabrics along the scallop line and then stitched a seam just above the line. In the image below the black dotted line would have been my cutting line for the fabrics and then I stitched on the red line above. As you can see this makes the scallops slightly different shaped and it was very awkward stitching up and down along these cut out curves. As curvy and smooth as I tried to get the stitching, the scallops still came out a bit cone shaped toward the bottom edges. So I decided to start again, leaving fabric below the curved lines during the stitching. I knew if I stitched exactly on the lines I had drawn that I would have the best chance at smooth round scallops. In the image below, the black dotted line is my stitching line and only later after stitching did I cut the fabrics along the red line. Once the front and back lining pieces have been marked along the scallop line, join the lining front and back pieces at the shoulder and the main fabric front and back pieces at the shoulder. In the following pictures you will see that I didn’t join the shoulders until after stitching the scallops, but really it’s easier if you do it first. So don’t do what I did, hehe. Place the main fabric and lining right sides together with the wrong side of the lining facing up. You should see the stitching line you previously marked. Pin the pieces together well along the stitching line. 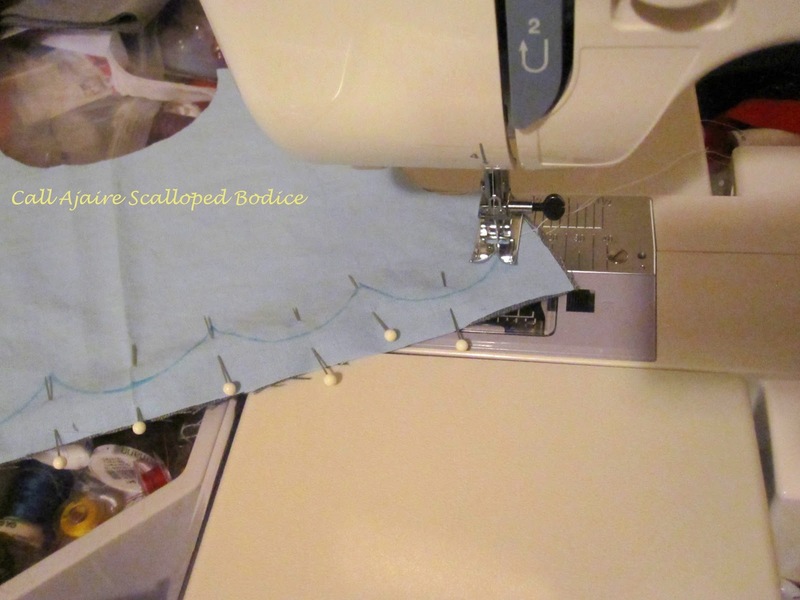 You don’t want the fabric to shift as you sew the scallops. Stitch right along the marked line stopping at the points to pivot the fabric. Once the line has been stitched you can then cut away the fabric below the stitching leaving a small seam allowance. It is best to pink the edges or clip the seams and points as well as you can to make turning right side out go as smoothly along the curves as desired. Since this bodice has a peter pan collar I opted to sew the collar to the main fabric within the seam allowance before sewing the scallops, but after sewing the shoulder seams. This may seem confusing since I didn’t take any pictures of the collar sewn in, but in the picture below I can assure you that there is a collar sandwich going on, hehe. I even outlined where one side of the collar is hidden in blue. 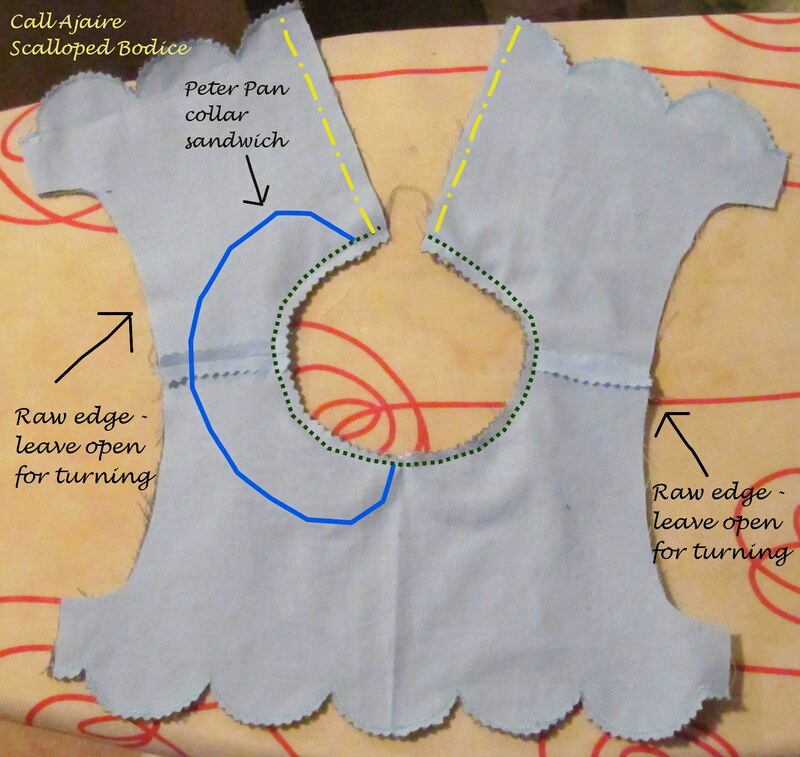 Once the scallops were stitched and clipped, I then sewed the final collar seam on black dotted line below which shows where I stitched through the lining, peter pan collar, and main fabric. If you were making a fold over button placket you could also so the yellow dashed lines, but since I was putting in a zipper this time I left them raw at this point. I also left the sleeve edges unsewn. Clip the edges (or use pinking shears) of the collar seam and then you are finally ready to flip the whole bodice right-side out. Take care to smooth the curves and iron as you go to really make the collar edge and scalloped edges curve as they should. It’s very satisfying to have the collar and scalloped edges complete at this point. All the tough work is left behind. 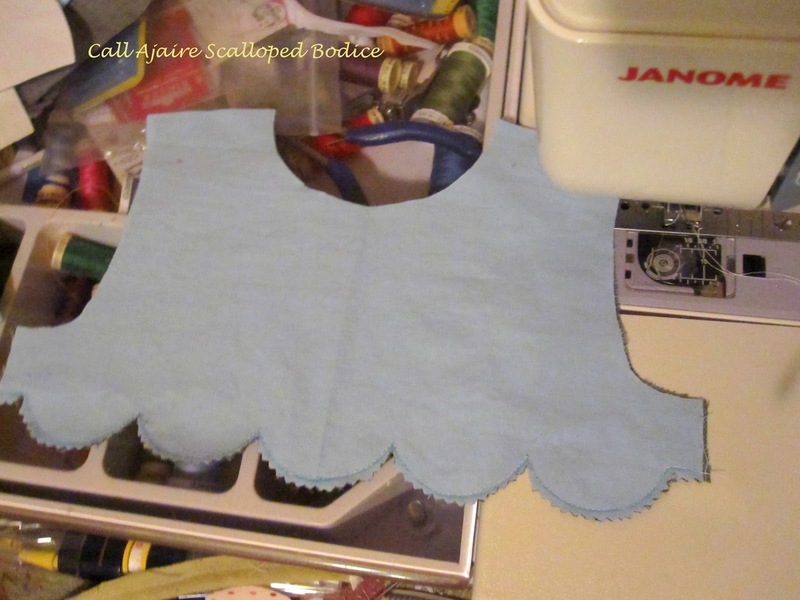 To attach the scallops to the back and front skirt panels, first attend to the back center seam. I used a zipper, but as I’ve mention before a button placket works nicely. Just remember to line up the back center so the scallop pattern is maintained. Now the back and front can be handled the same way. Line the skirt panel with right side facing the wrong side of the bodice, matching the bottom edges of the arm opening to the top edges of the skirt. In the image above the yellow dotted line is where the skirt panel top edge is hidden under the bodice. Pin well and stitch right along the scalloped edge attaching the bodice to the skirt. Once the edge is stitched the back of the fabric should be finished so that it won’t pull or unravel during wear or washing. This will help the scallops maintain their shape as well. 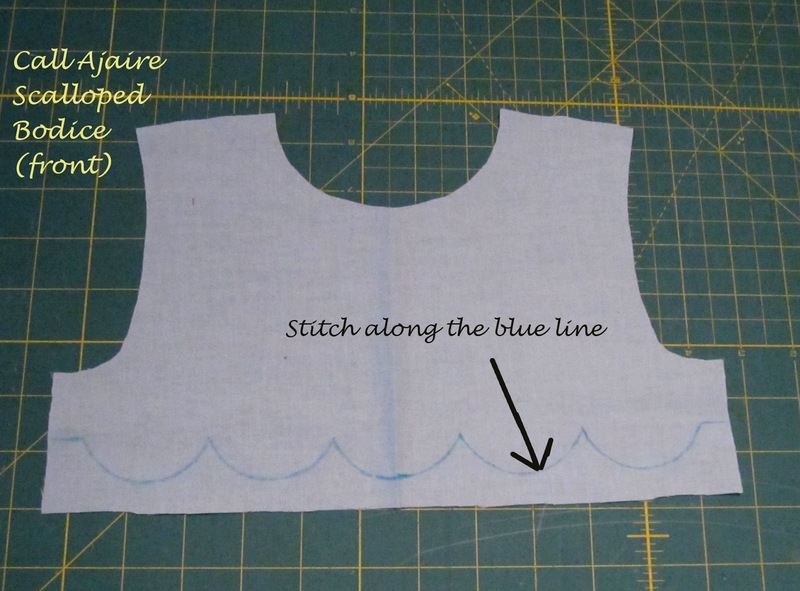 In the image below the blue dotted line above the stiching is where the skirt panel can be clipped and finished. Now that the scalloped bodice is complete you can finish the dress as usual. I sewed the sleeves into the bodice and then sewed the seam from the sleeve cuff down the side of the skirt on both sides. Even though this post is lengthy, there is really just one tip that is important. Sew along the line of the shape you desire. This will give you the best result. It may seem obvious, but it took me a few tries to realize how simple it really should be, hehe. I’m certainly not an expert so I would love to hear if anyone else has tried something different and had success! Is there a step you’d eliminate? Something to make the process go more smoothly? I stopped by to tell you to send me an email for the prize info (I only have your Twitter info), but then I saw this beautiful dress and had to leave a comment. It is absolutely ADORABLE!!! Love the scallop details. great instructions…….Thank you for sharing with the Clever Chicks Blog Hop this week; I hope you’ll join us again! This turned out so cute! Thanks for sharing. Precious! I love me some modified bodices, and this one is great. Thanks for sharing the tutorial! Great tips. What a fun esign. I would have done the exact thing you did the first time! Looking forward to attempting some scallops of our own!! Thanks for the helpful tips and advice!! Gorgeous! Thanks for sharing how you did this! Thanks for sharing @ Submarine Sunday! Wow, this is adorable! I scrolled through a lot of your creations and I am amazed at your talent 🙂 You have made some lovely items for your daughter. I am now following you and I look forward to visiting again! Wow…this is so, so adorable. I love the scallops…love! I love the feminine detailing with a gender neutral fabric. You just made my 'to-sew' list that much longer…ha. Thank you for sharing this. Your instructions were so clear that I tackled this for my daughter. I love the way it turned out and I couldn't have done it without your fantastic tutorial. nice choice of fabric colors/design! 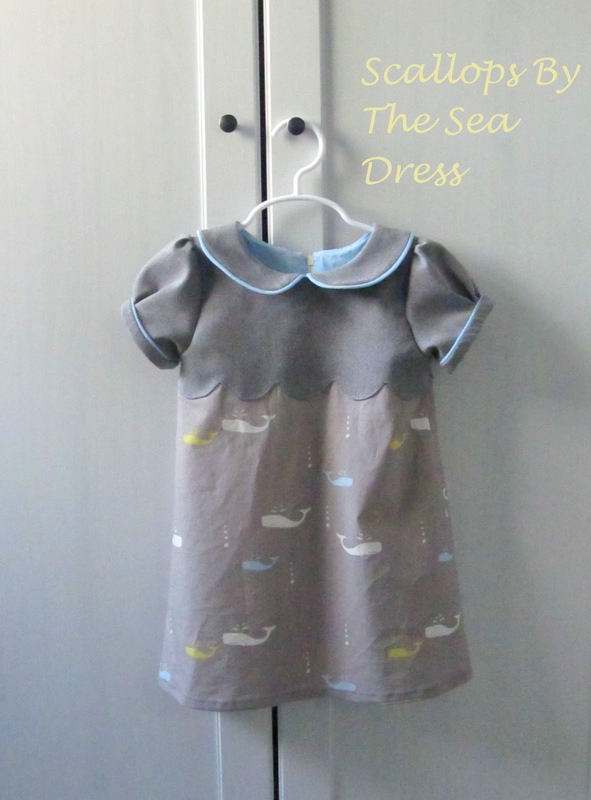 do you offer free pattern for this dress? thanks! !